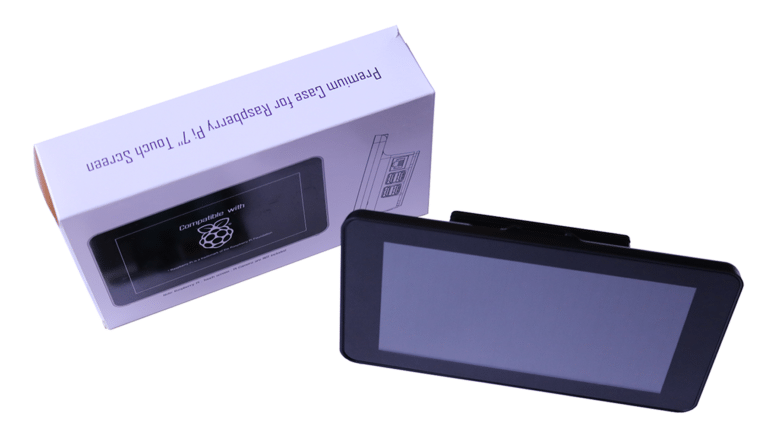 I recently acquired an official Raspberry Pi 7″ touchscreen display from my pals over at Element 14. These screens have been out for a long time and are already well documented, so I’m not going to go into the ins and outs of the screen itself today. Whilst I do have some fun project ideas for the screen, I can’t do any of that until I sort out some decent protection for it. If you haven’t seen one of these screens in the flesh then you won’t know that they feel VERY delicate! I’ve also heard multiple reports of the glass layers on the front of the screen slipping off – so wrapping this thing in a lovely chunk of plastic is my first priority. 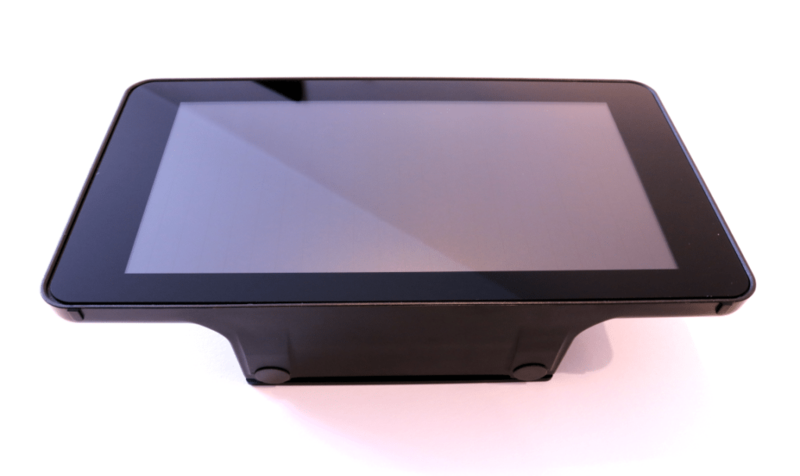 Unlike cases designed just for the Pi itself, there aren’t many touchscreen display case options for the official screen. For some reason the touchscreen case market hasn’t taken off in the same way. However, the options we do have all appear to be quality choices for your new vulnerable panel of glass. 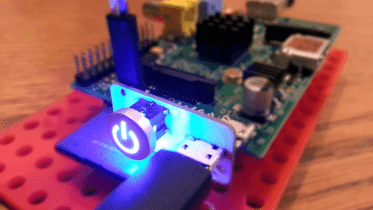 The most common case I came across was the acrylic frame from Pimoroni. This thing is sold everywhere! It follows the theme of their huge Pibow line of cases, slapping layers of well-designed and well-cut acrylic together to create a good looking see-through casing. I believe you can also fit a Pibow case to the back of this stand, for ‘pibowey’ harmony (and a bit more protection). This was one of the cheapest cases available at £10 and comes in 6 colour options, however it wasn’t an option for me as I was after something that covered up the Pi. Another option popping its head up on my search was this rugged looking number from ModMyPi. This case rocks up at £14.99 which is middle of the road for the selection I’m covering here. It certainly ticked the protection box, but was a little too chunky for my liking. 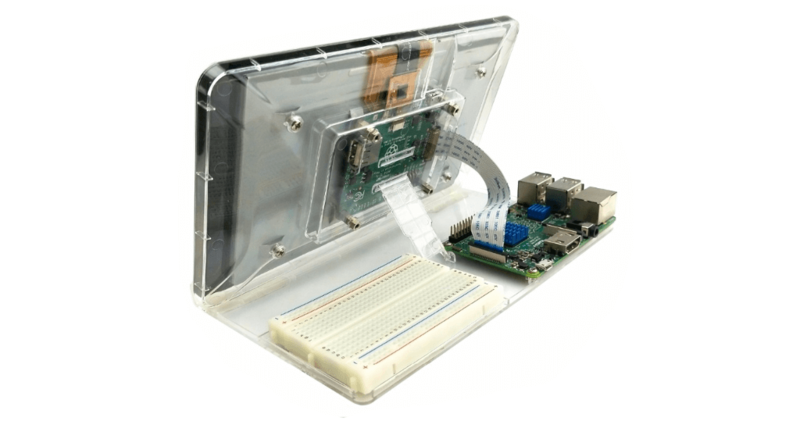 It also appears to leave the Pi open to dust – which really isn’t a massive deal – but others at the same price offered a more sealed back end. Worth mentioning that this case gives you the option to add your own printed design to the front layer as well – very cool! I have no idea who Multicomp are, but here is their offering for the official display. It actually doesn’t look too bad at all. 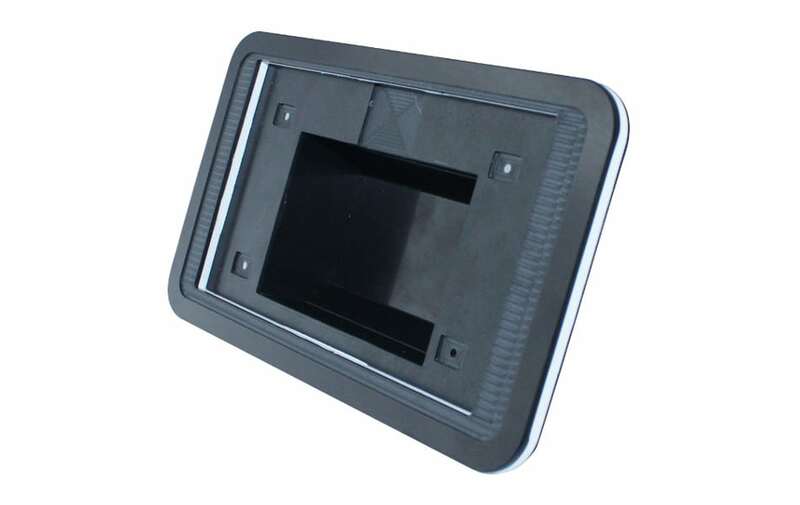 From what I can see in the product pictures, it has nice smooth lines, is reasonably low profile and looks to offer that flush front that I desire. However, the product shots don’t show you around the case so I couldn’t really see what I would be buying. I’m also not a fan of the ‘badger’ stripe through the middle either – and above all – that £27 price tag is way beyond my average wallet! SmartiCase are quite a unique company and damn good at what they do. In fact, I’m pretty sure it’s a one-man-band operation run by industrial designer Tom Murray. Tom recently ran a Kickstarter for the SmartiPi Touch, which is his take on a case for the Foundation’s display. Tom’s case is low profile, has an adjustable angle and LEGO compatible sections. 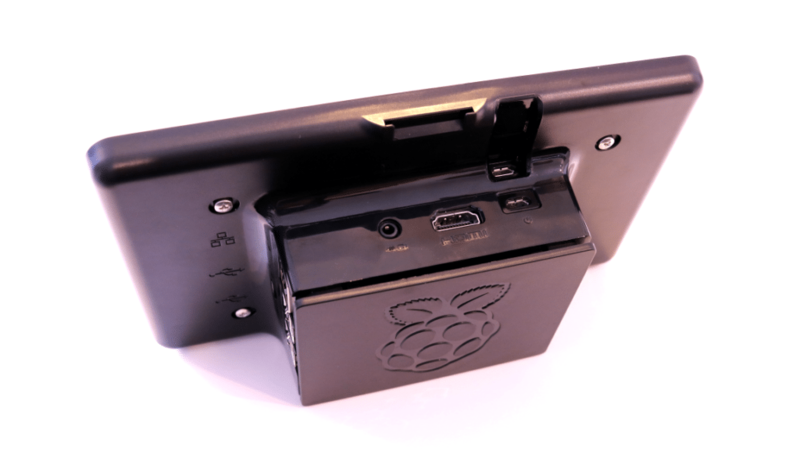 The Pi is easily removed thanks to a little door at the back, works well with HATs, and the screw mount options make it a great shout for attaching to your wall. Unfortunately it isn’t out for Retail purchase just yet, but pre-order is open starting at around £18. As I needed protection fast, I had to skip this option. John from JFC Engineering sent me one of their machined stands to check out after finding this blog post – you can see his comment below in fact. The PiggiPi stand is the only metal offering in this list, coming as a 2-piece kit that you can assemble yourself in 5 minutes. It’s obviously tough as nails due to the material it’s made of, but as PiggiPi opted for rear port/pin access, there isn’t any protection of the Pi at the rear. The screen sits almost flush with the front metal surround and looks great on a desk. It sells for £30 which makes this one of the more expensive cases here, but that’s not bad at all considering the material and machining costs. See my full review here. I can’t get enough of cheap Chinese gadget shops, and a few weeks back I found this very simple acrylic base holder for the official screen for just under £4. I couldn’t say no at that price, and didn’t expect much from it. I figured the screen would fall over with the weight, however to my surprise the holder works well and is really quite smart. It may not technically be a ‘case’, and it may offer pretty much zero protection to your delicate screen, but there’s no denying how slick it makes your display look on a desk. 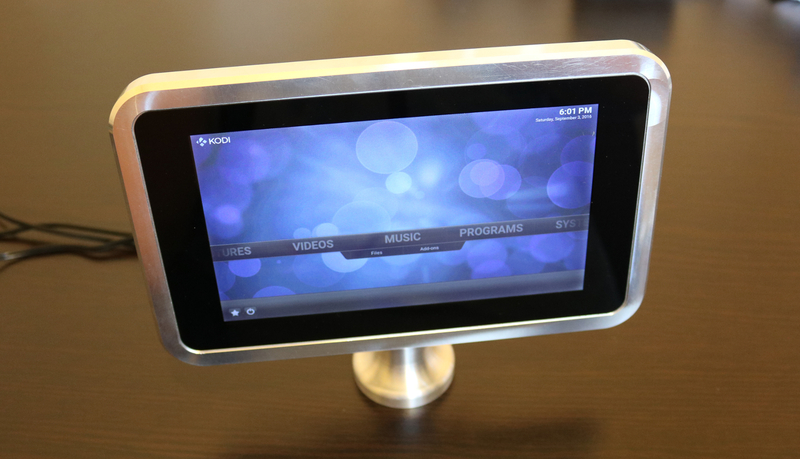 It makes your Pi display looks like a floating tablet PC – no bulky case edges or excess, just pure glass at a nice viewing angle. Price= yes. Looks = yes. Protection = not a chance! Another find from a Chinese store, this time Aliexpress. 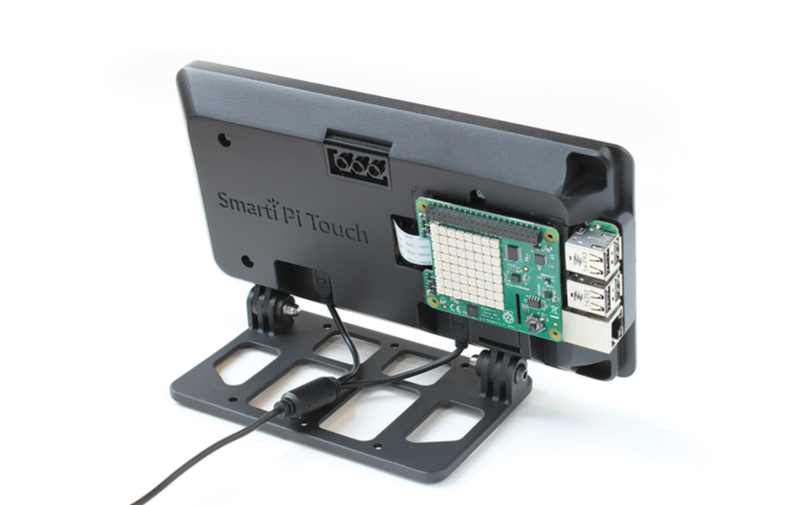 We’ve all seen wooden cases for the Raspberry Pi itself (check out my C4Labs post), but this is the first one I’ve seen for the official touchscreen. It looks a lot like some of the other options here, however the bamboo really sets it apart. They’ve got a proper smart hipster-desk-thing going on here! It’s currently going to cost you around £14 (delivered), which is about mid-range of the cases I’ve featured in this post. Just expect at least a few weeks for delivery of course. I had to give this thing a name because it doesn’t have one – I can’t see a brand name or model number mentioned on the Aliexpress listing. However, lack of identity aside, my first impression was that this was ‘just another plastic case’. However, look a little closer and you’ll see that the designers have taken a different approach to viewing angles here. 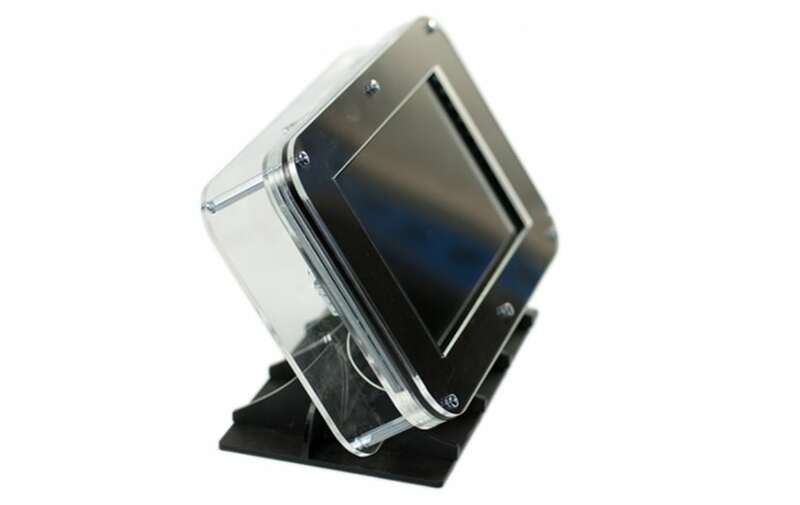 You can decide which way to stand this case up – one way offering a 45 degree viewing angle – the other offering 60 degrees. Is that enough to make me want to buy this one? Maybe not – it’s not the best looking option here. This case will cost around £19 (delivered) as well, so slightly above the mid-range point here. Yet another no-name option from far away in the land of Aliexpress. This case has gone for the clear look but not using the laser cut layers that we’re used to seeing in the Pi case market. What’s different about this one? Well it’s got an adjustment stand at the back to offer different viewing angles, but the exciting bit is the sections behind the screen for the Pi and a breadboard. Whilst that prototyping area is the ‘wrong’ side of the screen, I still dig it as the touchscreen can be easily turned around when programming. A unique offering and pretty good value at around £13 (delivered). I bought this case from the Pi Hut after considering all some of the options above (I have added some after making my purchase). First up, the entire screen and Pi are cuddled in a solid single piece of plastic. That offers the protection I wanted from both knocks and dust, and gives me confidence that no parts of the casing can snap off. Secondly, the screen sits flush with the front of the case. That gives it the stylish and modern look I wanted for my office, however doesn’t quite offer the screen glass protection as some of the other options here. The case can hold a camera module in the top section, the rear panel pops off to allow HATs to be fitted, and the entire body is black (or white if you buy from Micro Center in the USA). It ticked all the boxes for me, and that middle pricepoint of £15 got my MasterCard out in record time! Update: One setback with this case – the screen has to be mounted upside down. Now whilst you can change a setting to turn the image around, the viewing angles don;t seem to work as well with the screen mounted this way. Something to consider. Case selection is always a very personal thing. From your protection needs to your favourite colour, we’re all going to want something different and at a level we can each afford. I wanted to share the screen cases I found as there aren’t many to choose from, and I had quite a few people ask where I got mine when sharing on Twitter. If you stumble across this blog when shopping for your own, maybe it’ll help you find some touchscreen display case options you weren’t aware of. If you’ve come across any others please add a comment below, I’d love to see what else is out there. 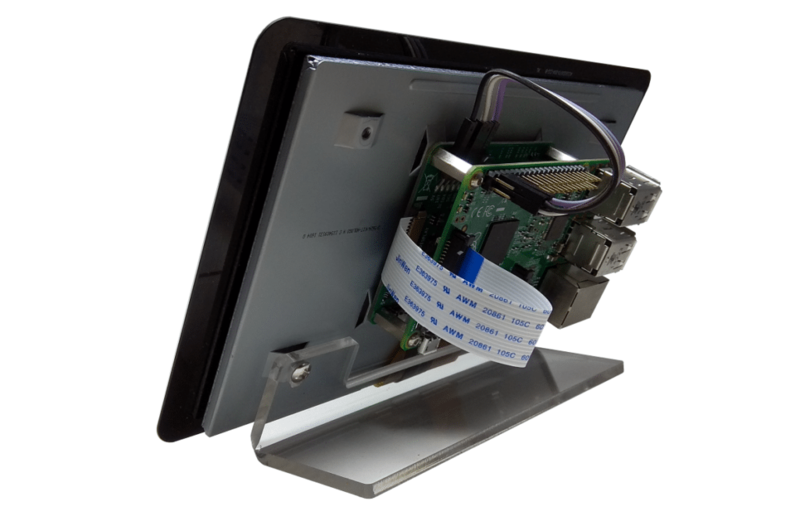 6 Comments on "Raspberry Pi Touchscreen Display Case Options"
Did you have to fix the screen orentation? If you like I can send you one from Piggipi.com. It’s a little different from the ones you have looked at. Thanks John, will send you an email. I really like the one you have chosen but it lacks the space for add-on boards or hats and its plastic, I would love one like that in aluminium. I saw this one and fell in love really https://www.sferalabs.cc/strato-pi-touch-display/ but then I saw the price and went Waaaaaaaaat. 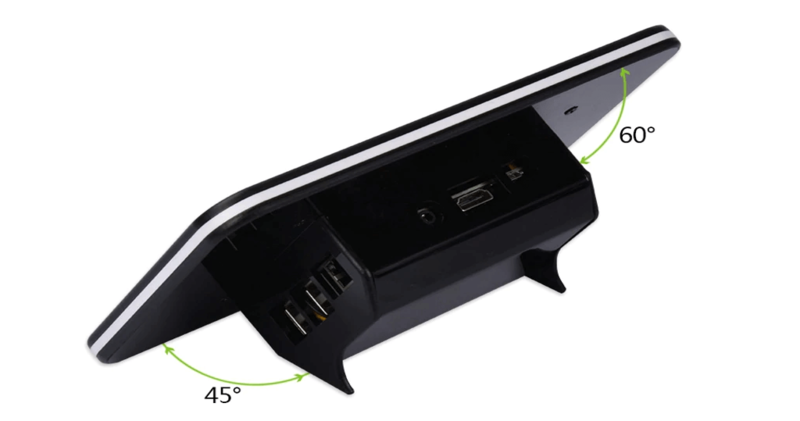 The OneNineDesign case requires the unit to sit upside down. I *do* know the pi can rotate the display but with the display upside down, the view angle goes bad REALLY fast.